Having achieved success at scale, e-commerce startups can largely attribute their growth to their ability to find and target new international markets for their products or services once they reached the nether limits of their domestic audience. For many based in the U.S., it’d make smart business sense for them to look to Canada. Surprisingly, however, Canada often takes a backseat to Chinese and Asian markets despite its clear competitive advantages of proximity, culture, language, and low barriers to entry. Too often, Canada is overlooked due to poor border experiences by U.S. merchants and their lack of understanding about customs and GST/HST costs. The good news for U.S. startups is that these obstacles are not at all difficult to surmount once you understand the most promising business structures, address requirements, and relatively straightforward legalities and options involved for expanding your e-commerce market in Canada. The reputation of a small business can be easily damaged by a bad online review. Yelp.com recently prevailed in a California case where a law firm tried to force the site to remove negative posts, which has left business owners concerned about being vulnerable to anyone who chooses to malign them, as there are virtually no consequences in doing so. So what measures can a business take to address negative reviews, and mitigate any potential damage? Here are three key tips: ask happy customers to post reviews of their positive experiences; respond immediately and politely to legitimate problems expressed online; and lastly, provide a factual rebuttal when necessary. Do you consider your AI startup to be among Canada’s best? If so, you’ll want to look into the ElevateR Pitch competition. Designed to get your company in front of international media, global tech leaders, and investors, you’ll compete with other top AI finalists across Canada, culminating in a “face-off,” with over $1M CAD in funding awarded to select finalists. The final four AI startups will have the opportunity to pitch live on Elevate Main Stage before Al Gore. Interested? Apply via http://elevatechfest.com/elevator-pitch by July 31st. A summary of requisite qualifications is provided in the post. “In the startup world, growth is everything. Companies that don’t grow don’t survive.” The imperative for a high growth rate is most acute in emerging industries, the author continues, where the first to hit the market have a competitive advantage. So what do you do when your company’s growth has stalled? First, understand you can’t restart its engine alone, as growth only accelerates with a solid team of people pushing it forward. That said, here are the author’s tips for jump-starting your company’s growth and building it to last: add empathy screening to your hiring process; refurbish your data approach; and invest in relationships, not sales. When it comes to innovation in the cannabis industry, Toronto has the edge over other likely candidates like Vancouver much like it does in so many other areas, such as tech: a strong investor community that works with venture capitalists to nurture startups. In this instance, the startups are cannabis-focused and cover everything from vaporizers to blockchain tracking technology. The author of this article solicits commentary from pioneers like the founder of Ample Organics, the number one seed-to-sale software for Canada’s cannabis industry, and the co-founder of Leaf Forward, the country’s first cannabis business-focused accelerator, about Toronto’s leading role in professional cannabis innovation. As any business owner knows, when you’re running a growing company, many issues compete for your attention. In this article, five CEOs share their go-to methods for taking care of business, from keeping your high-energy times open and being ruthless about eliminating interruptions to mastering the art of delegating non-critical tasks and getting ideas out of your head. We’ve all heard it: find your passion and you’ll find happiness. According to the findings of a recent study by Stanford and Yale-NUS psychologists, this isn’t the best advice to follow: in fact may actually inhibit our learning and resilience. The phrase “find your passion” encourages us to approach interests from a fixed mindset, which could manifest itself in a number of negative ways. For instance, it could lead to a passive approach to your business, and life in general, and actually gives you an easy out when something is challenging. What’s their advice, then? Stop trying to find your passion, and develop it instead. This mentor to aspiring entrepreneurs writes that one of his challenges is to make sure their business idea is a match for them. He continues: “Many technical entrepreneurs still tend to believe that their technology and passion are ninety percent of the equation, and the business will happen by default.” He holds that this mismatch of interests compared to key business drivers is the primary reason that the majority of new ventures ultimately fail. He outlines seven questions to ask to ensure you start on the right track, from whether there is a real business need for your proposed solution to identifying your sustainable competitive advantage. 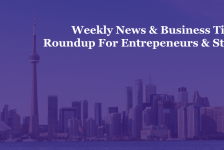 The City of Toronto is holding three separate forums designed to help small business owners leverage new innovations and technologies to take advantage of the efficiencies they offer. The information and discussion sessions are taking place on July 11th, 12th , and 18th in Scarborough, Etobicoke, and North York, and will include presentations on data science, automation, Artificial Intelligence, cybersecurity and other technologies, as well as what resources are available to help business owners. Links to register for the three different forums are provided in the article.